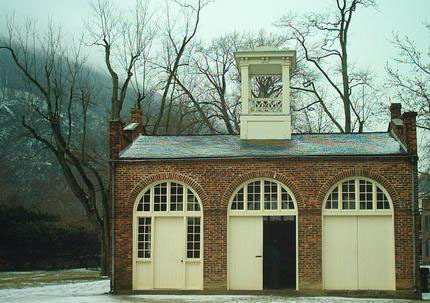 John Brown was hung in Virginia in 1859 for attempting to take over a Federal arsenal in Harper's Ferry. His antislavery obsession made him a hero and the song increased his renown. Arguments continue today as to whether he was a martyr or a terrorist, but few remember the others who died in his holy war. Brown recruited two antislavery soldiers in Oberlin, Ohio. 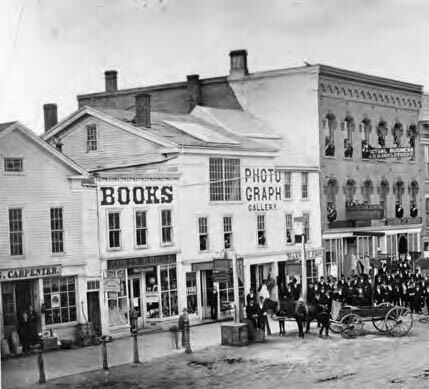 The town was an oasis of free thinking, founded in the 1830s by reformers who opened a college to women and African-Americans, a radical admissions policy at the time. Oberlin attracted fugitive slaves and free-born black families seeking educational opportunities. The Pattersons, the Learys and the Langstons were among the free blacks who moved there from the South to take advantage of the college and its preparatory school. Brown knew many Oberlin men had a commitment to the antislavery cause. 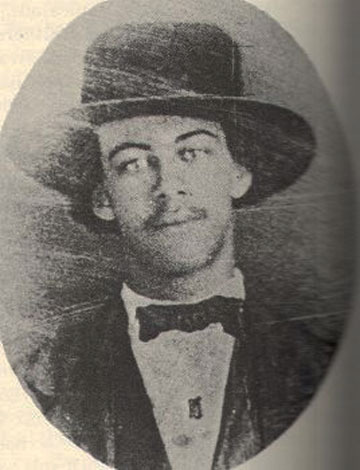 Charles Langston, one of the town's leading black men, refused to accompany Brown, realizing they needed many more men to carry out their audacious scheme. 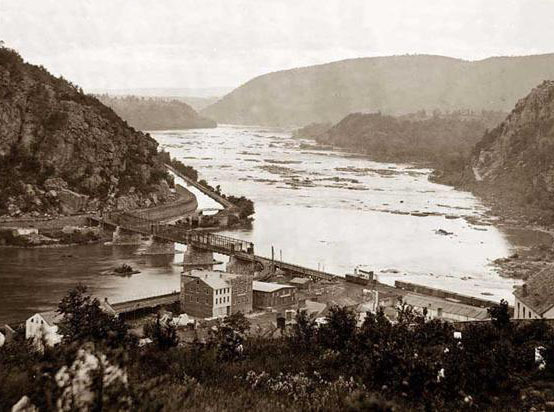 Ignoring his wisdom, two young men agreed to rendezvous for the attack on Harper's Ferry. One was Lewis Sheridan Leary who left wife Mary Patterson Leary at home with a new baby, telling her he was traveling on business. would start a slave revolution. Charles Langston was right. The U.S. Army easily defeated Brown's tiny band within hours of their assault on the arsenal. were stored is now a federal park. "A wretch, mortally wounded, was dragged from the river by citizens, and laid upon the bank shivering with cold and loss of blood. He begged to be taken to a fire, promising to confess everything. The bystanders carried him to an old cooper's shop hardby, where a hasty blaze was kindled…He entreated someone to write to [his family] and inform them of the manner of his death…After lingering in great agony for 12 hours he died." Mary spent the war years living with her parents in Oberlin, working as a milliner, and raising Louisa Sheridan Leary. 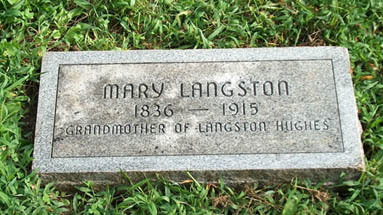 After the war she married Charles Langston and moved to Kansas where a son and a daughter were born. Charles Langston had been wealthy in the years before the Civil War but spent his slaveholding family's legacy on the abolition movement. At his death he left Mary with little. Grandson Langston pictured Mary as a poor, proud woman---too proud to ask Charles's rich relatives for help. She might have sought assistance from the graying abolitionists who revered the memories of Sheridan Leary and Charles Langston but she made do in one of the few occupations open to a widow. She took in boarders. 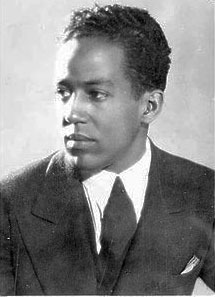 Langston remembered Mary sitting in her rocker, holding him in her lap and telling him tales in which, "life moved heroically toward an end …Nobody ever cried in my grandmother's stories. They worked, or schemed, or fought. But no crying." 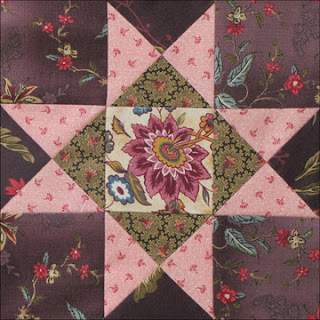 The reproduction quilt above was the design for a kit done a year or two ago for my Civil War Homefront collection from Moda. The inspiration was an antique from the International Quilt Study Center and Museum. 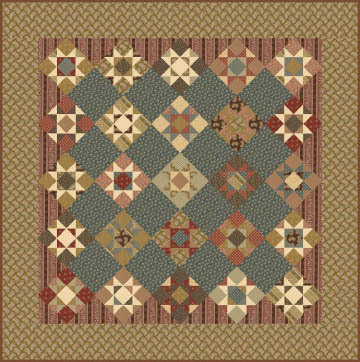 We really don't know what quilters called this design during the Civil War years. Today we tend to call it Ohio Star (BlockBase #1631). Other published names include Variable Star, Eastern Star and Western Star. Carrie Hall gave it several names in her 1935 index to patterns, The Romance of the Patchwork Quilt, among them Texas Star and Ohio Star. A - Cut 5 dark squares 3-1/8". B - Cut 1 dark, 1 medium and 2 light square 3-7/8". 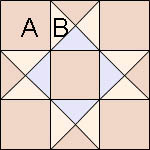 Cut each into 4 triangles with 2 diagonal cuts. 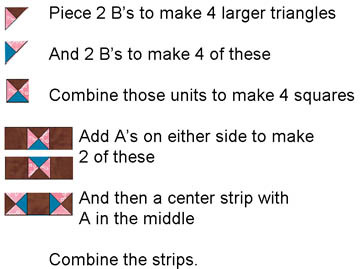 You need 4 dark, 4 medium and 8 light triangles. Mary should be remembered for far more than her grandson's art. another wonderful story, I am really enjoying these weekly american History lessons. I love hearing these stories. Read your blog almost daily. Thank you for sharing so much history with everyone. Thank you so much for sharing these blocks with us! Will you be leaving them up beyond the end of the year? Or do we have to download all of them and save them on our PCs while they're still available? I think you better download them. I intend to leave them up for 2012. But technologies change...I can't promise what kind of clouds we'll have floating around in the future. I love the stories as an Aussie I only know thw main facts of the Civil War. I have been faithfuly collecting the patterns to make one day. Thanks Barbara. I just discovered your blog and I am totally fascinated by the personal stories and information you have gathered about the Civil War. Thank you for your painstaking research and creativity. We appreciate it! As always your work informs and inspires me! This is a beautiful and, seemingly, easy to make block. I look forward to trying it! Enjoyed the story and the Langston Hughes connection. The Ohio Star block seems to always turn out pretty. I have completed my block and have posted it along with a how-to on my blog. Another great post. I love the Ohio Star block. It's always been one of my favorites. Hi, Barbara, I am now following your blog. going back through your archives. I'm a librarian with a patron wondering about the history of the Drunkard's Path pattern. Do you know, was it once named the official state quilt pattern of Oregon?